Tony Coburn is a born and bred Liverpudlian and is a resident musician at The Cavern Club. He performs solo acoustic shows from Monday to Friday and is our Paul McCartney in our resident band The Cavern Club Beatles. The Cavern Club Beatles Saturday night show is not to be missed and has gained huge popularity in a short period of time. A highlight for The Cavern Club Beatles was a USA tour to celebrate the 50 Year anniversary of The Beatles coming to the USA. Tony was chosen, after a world-wide search, by Geoff Emerick (studio engineer known for his work with The Beatles and Paul McCartney solo albums) as the closest sounding voice to Paul McCartney. Tony was cast in a show The Sessions, produced by Stig Edgren, which was to take place in Los Angeles. 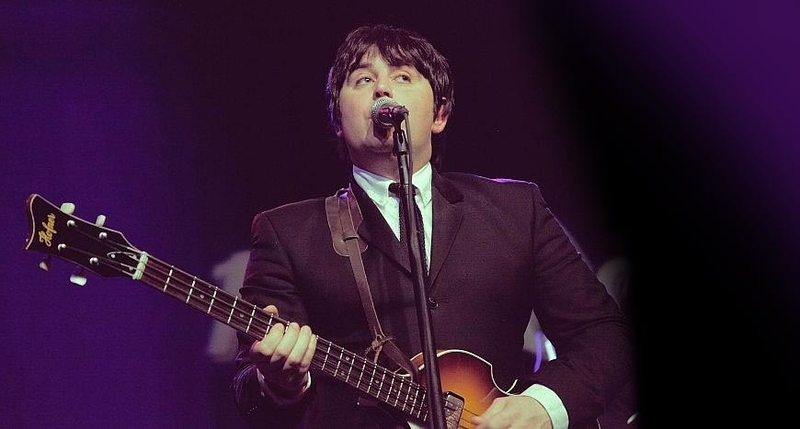 Tony has travelled the world portraying Paul McCartney including a 6 week stint on Broadway, NYC, portraying Paul McCartney in a Beatles musical. Tony had the pleasure to meet and jam with his idol, Paul McCartney, at the Concert for George at the Liverpool Empire theatre with his first band The Blue Meanies. If you’re a Macca fan, be sure to catch Tony’s solo shows to see a wide range of hits from The Beatles and also some rare bootleg and album tracks from Paul’s solo career. You can see Tony every, Tuesday, Wednesday, and Thursday in the Cavern Club, as well as every Saturday and some Fridays with The Cavern Club Beatles! Check What’s On for details.